practice of prayer in their age. 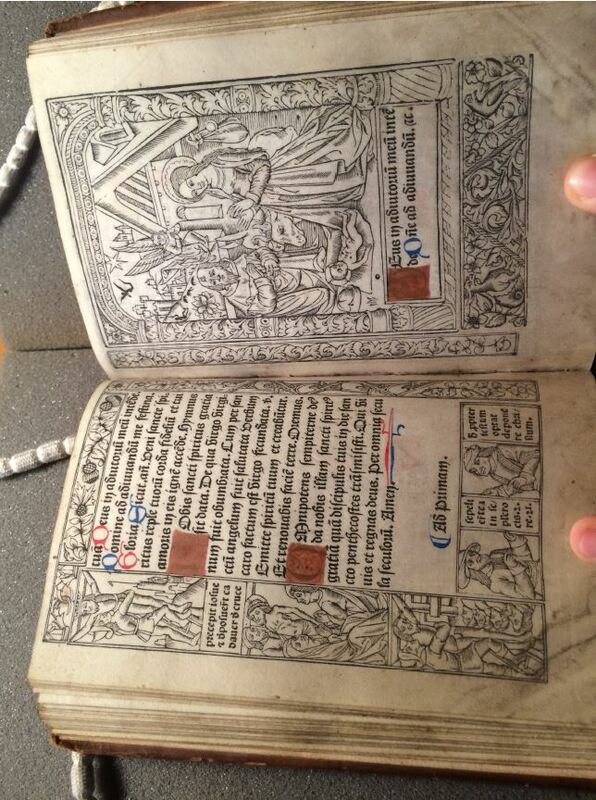 When the Parisian printers of the 1470s started to take Books of Hours to press, these had already been standardised in terms of their prayers and corresponding illustrations. To upgrade the most popular book of lay devotion, printers added cycles of lavish border illustrations – to a degree that previously had only been seen in the most exclusive of manuscripts for princes. The thematic range of these marginal compositions is considerable: from catalogues (e.g. virtues, Sibyls, sacraments) via narrative sequences (e.g. passion, Job, prodigal son) to the adaptation of independent text-image-groups which brought with them their own traditions (e.g. Danse Macabre, 15 signs of the Last Judgement, Biblia Pauperum). Even though the illustrations have always been regarded as essential for understanding Books of Hours, this specific phenomenon has rarely been described and barely understood, despite the fact that such decorated Books of Hours can provide significant insight into contemporary reading habits and devotional practices. This makes it necessary to take into account all parts of the books equally. The Book of Hours combines prayer texts which allowed the owners, who in late fifteenth-century were mainly laypeople, to keep regular Hours following the monastic model. The main text is the Little Office of the Blessed Virgin Mary which usually is supplemented by the two Hours of the Cross and the Holy Spirit. These three offices were often noted down exactly as they were said, weaving the offices together by having the single hours follow each other directly. The prayer sections formed thus – i.e. the start of each Hour of the officium parvum as well as one at the start of each of the two small offices – are usually marked by large-scale images which provide a more abstract link to the topic of the texts; thus the images for the Office of the Blessed Virgin Mary show usually either a Life of the Virgin or the Passion. The printed Books of Hours add to these already complex text-image-relations the border decoration with their own text-image-combination. These usually connect in some way to the main body of the text – the Office of the Blessed Virgin Mary preferably is framed by the Biblia pauperum; the Office of the Dead by scenes from Job or a Danse Macabre –, but rarely do the border cycle match exactly the units of the central text unit. If the primary text ends earlier, the cycle in the border is either repeated or different marginal illustrations are used. In addition, the border cycles are used by printers over the years in different editions which results in a constant shift in the alignment of border cycles and the central text on the page. The intentional or serendipitous juxtapositions on the opened double-spreads encourage contemplation and meditation on the combined elements. I would like to discuss briefly under these aspects three consecutive double-spreads and will open the Bodleian Book of Hours at the end of the first and longest Hour, the Matins for the Hours of BMV (e3v/e4r, figure 1). Here, the Office of BMV is framed by a Biblia pauperum-cycle, which in its main scenes taken from the New Testament. These have a clear Mariological focus, from the birth of Mary to her assumption – the last Hour of the Officium parvum is in the main text also illustrated by the coronation of Mary. The Matins ends on a verso-page whose lower third is empty except for the caption announcing the following Office of the Cross. On the facing page, the depiction of the crucifixion takes up the whole page; the beginning of the invitatorium of the Office of the Cross is placed in a small cartouche within the image. Christ on the cross is thus doubly present on the open spread since the Biblia pauperum-cycle on the margins just reached the point of the nailing to the cross. Main text and borders converge in such a way that the two events of the passion follow each other in correct chronological order and can be viewed simultaneously in one opening. The nailing to the cross is further contextualised within the history of salvation by two typologically related scenes from the Old Testament. Turning over one page (figure 2), this narrative thread continues since now the border of the verso page (e4v) shows the crucifixion in slightly modified form from the previous large scale depiction since the mourning women under the cross are replaced by Longinus with the lance. This is supported by the creation of Eve (Immisit dominus soporem in adam) and by Moses beating water out of the rock. The main text for this page consists of the full Matins for the Office of the Cross, i.e. the first verse of the hymn for the Hour Patris sapientia veritas divina which talks about arresting Christ. This in turn had been a topic in the margin, including its typological antecedents, a few pages previously: e1v. The Collect for the Officium which is repeated at every hour starts with the words: Iesu christe fili dei vivi pone passionem crucem et mortem tuam inter iudicium tuum et animam meam. It seems remarkable that the complete text of the first Hour of the Office of the Cross coincides precisely with the crucifixion in the Biblia pauperum-inspired marginal decorations. As mentioned above, the shifting process of aligning margins and body of the book would make this quite hard to plan, and due to the scarcity of research on this, I am not yet able to determine whether this coincidence is a common one. In any case, the Bodleian copy achieves a rare harmony of the two text-image-cycles in the body and the margin of the Book of Hours. The following recto-page (e5r) shows a full-page rendering of Pentecost as opening illustration for the Office of the Holy Spirit which then takes up all of the following verso-page (e5v). Finally, the last of the three double-spreads (figure 3) surrounds the text of the Officium on the one hand by the Descent from the Cross and its typological figures (e5v), on the other hand with the Nativity for the Prime of the Office of the Blessed Virgin Mary (e6r). The Matins of the Office of the Holy Spirit can be vaguely related via the text of the hymn with the Nativity, but another link is much more obvious: Mary and Joseph are clearly looking not towards the Christ child lying on the floor or towards the angel flying between them but more or less out of the picture across the page to the Descent from the Cross. Metal cuts allow a careful positioning of sight lines, and even if this detail should have been taken over from the exemplar, these cross-glances constitute a striking connection between the two image cycles. The Christ child with his halo featuring a cross is framed by Mary and Joseph in the same way as the crucified is flanked by Mary and John. Again, the vertical axis of typological references on the page of the book complements the horizontal line created in the act of reading across the double-spread and its text-image-ensemble. In this way, nearly every opening of the prayer book offers a complex interplay of texts and images, inside and outside the main body of the pages. This comes on top of the composite nature of the Offices which incorporate psalms, antiphons, and lessons and are anchored through further short texts within the liturgy. A new framework is created which is not simple ‘decoration’ but has to be regarded as crucial part of the print products. To show this in more detail must be the focus of a more in-depth study. Stefan Matter did his doctorate on the Nazarenes, and was granted his Venia legendi for a study on texts and images about the medieval concept of love (Reden von der Minne, Tübingen 2013). After research fellowships held in Oxford, Tübingen, Bremen, Bern and Wien, he is currently based at the Universität Freiburg/Switzerland and is pursuing a research project on German prayer books. The two typological scenes (Thubalkain prepares iron tools; Isaias is sawn apart) are only extant in the 50-folio xylographic edition which provided the source for the marginal illustration. On the exemplar cf. Berthold Kress, ‘The Block-book Biblia pauperum as a Source for Printed Borders in France, Germany and England’, in Tributes to Jean Michel Massing: Towards a Global Art History, ed. by Mark Stocker and Philip Lindley (Turnhout, London: Brepols, 2016), 119–31. Roger S. Wieck, Prayer for the People. The Book of Hours, in A History of Prayer: The First to the Fifteenth Century, hg. von Roy Hammerling, Brill’s Companions to the Christian Tradition, 13 (Leiden/Boston: Brill, 2008), pp. 389–440, provides a survey of content and form. GW 13073; the Oxford copy (Bod-Inc. H-165) however is not fully identical with the copy of ULB Bonn (Inc. 568, g) listed under the same number; this applies to the page breaks (e.g. f2v ff.) but especially to a number of the border illustrations (e.g. h3v). Cf. also Horae B.M.V., I, No. 8. Mary Beth Winn has been the main scholar to discuss the border illustrations in various essays, but without discussing how the different elements of printed Books of Hours relate to each other; for a summary cf. her article: ‘Printing and Reading the Book of Hours: Lessons from the Borders’, Bulletin of the John Rylands University Library of Manchester, 81 (1999), 177–204. – and now also the excellent survey by Caroline Zöhl, ‘Die zentrale Rolle der Marginalien und der Reichtum des Bordürendekors im Stundenbuchdruck’, in Horae B.M.V. 365 gedruckte Stundenbücher der Sammlung Bibermühle 1487–1586, ed. by Heribert Tenschert and Ina Nettekoven, 9 vols., Katalog Antiquariat Heribert Tenschert, 50; 75 (Ramsen: H. Tenschert, 2003–2015), IX, 4145–218, and the magisterial discussion of Books of Hours in Cristina Dondi, Printed Books of Hours from Fifteenth-Century Italy. The Texts, the Books, and the Survival of a Long-Lasting Genre, Biblioteca di Bibliografia Italiana, 204 (Florence: Olschki, 2016). so vermögen sie Einblicke in die Gebetspraxis ihrer Zeit zu geben. Vorzeichen des Jüngsten Gerichts, Biblia pauperum). 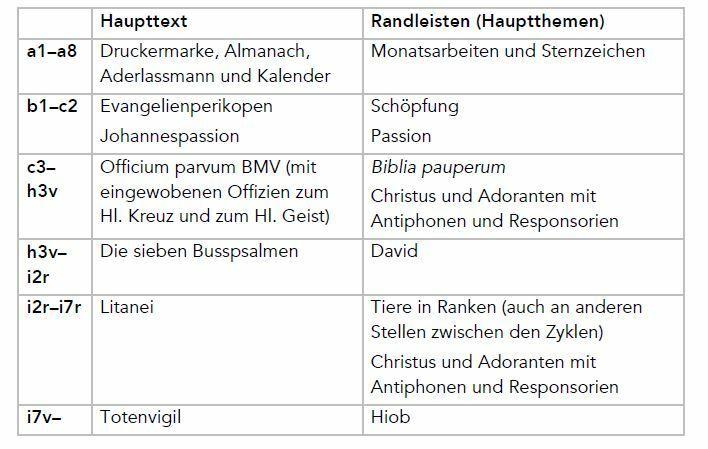 Das Stundenbuch vereinigt Gebetstexte, die den Besitzern – im späten 15.
entweder ein Marienleben oder die Passion). Stundenbüchern nun auch noch die Randleisten mit ihren Texten und Bildern. kann dessen Inhalt so zusammengefasst werden. darauffolgenden verso-Seite (e5v) ebenfalls vollständig Platz findet. Schrift vermittelte Verbindung von Text und Bild der Doppelseite. Freiburg/Schweiz und forscht zur deutschsprachigen Gebetbuchliteratur. the Christian Tradition, 13 (Leiden/Boston: Brill, 2008), S. 389–440. Stellen, z.B. h3v). Vgl. auch Horae B.M.V., I, Nr. 8.